Hello everyone, I’m back to the normal Monday schedule this week with no public holidays to mess me up. 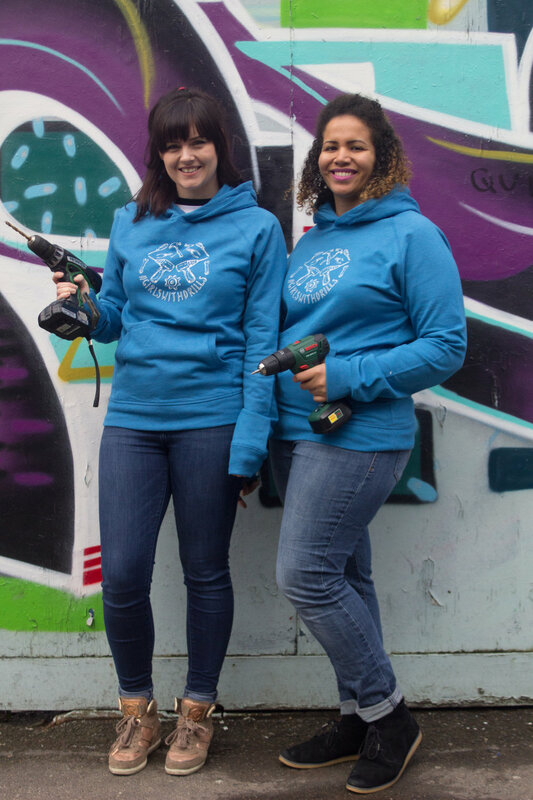 It’s time for another Meet The Makers interview and this week I spoke to Kisha Bradley and Ruth Amos about #GirlsWithDrills and whole lot else. They’ll both be joining us in Liverpool at the end of the month so we caught up on Skype ahead of that. DAN: So to kick off, Kisha can you tell us a bit about what #GirlsWithDrills is? KISHA: GirlsWithDrills is just a conversation starter. It started as a hashtag to get people talking about inclusion in Making. I think it’s just as simple as that really but there are certain things we do around it now to help us keep that conversation going and put action into inclusive making. So our t-shirt sales support kids in deprived communities and getting them into maker sessions, each shirt sold supports one child. We also have workshops which started because we were selling the shirts and then women were saying “we actually want to learn how to use a drill Kisha not just buy a shirt that says we can”. Is that about right Ruth? RUTH: Yeah I think we were each working on different projects which highlighted the fact that at times making could be inclusive, but it isn’t always inclusive and we just had some really interesting conversations. It started off as a personal project. The two of us were joking about using tools and wanting to raise awareness around some of those areas. DAN: So it sounds like you knew each other beforehand, how did you come to meet and get to know each other? KISHA: We had a few meetings talking about STEAM vs STEM and that’s kind of how it started. RUTH: Yeah Kisha runs a group on Facebook called STEMinists. I’d been to a few things and people said to me “have you met Kisha? You should meet Kisha”, so we went for coffee and talked through different projects. We thought “how do we not know each other?”. KISHA: Yeah it was perfect really, and then Sheffield Soup is where I pitched the idea for my business Bright Box. 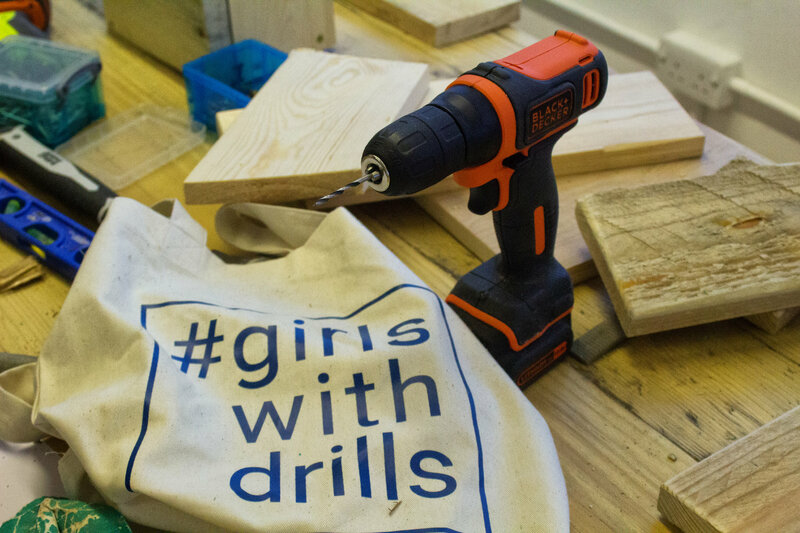 At the time I think I said “imagine a girl with a drill” and then several coffees later we had a hashtag #GirlsWithDrills. Some kids enjoying a Bright Box Maker session. DAN: Excellent, so there’s lots of other stuff to talk about. You mentioned Bright Box there, tell us more about that. KISHA: So my background is in engineering, I’m a mixed race female and l come for a deprived community. 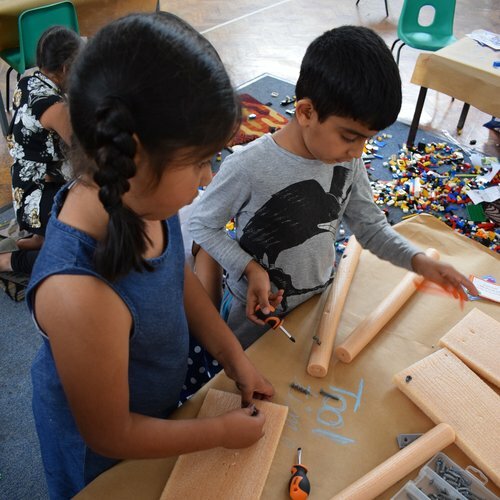 Going through that process to become an engineer it struck me that there’s really not enough out there for children to get engaged with engineering in a fun way. Focused around them or welcoming for them. So I started taking a Maker space to communities and just giving kids a chance to have to a go and make stuff. DAN: Oh you said taking to communities, do you go out in a van or something? KISHA: Ooh I would love a van, if someone wants to give me a van that would be fab. No I go in my partners car with all of our kit, and I go out to communities because sometimes for whatever reason people can’t get into the city centre or to some other location. So it’s best to take it into their community and there’s also people they’re familiar with, it’s really making it about them and what they want to do. DAN: You’re focussing on kids, so is it just for kids or do you get adults as well? KISHA: It’s aimed at kids primarily but usually we find the parents have just as much fun getting involved. DAN: Often they want to jump in don’t they? DAN: So Ruth I know that you host a YouTube channel, it’s called Kids Invent Stuff I think? Tell us about that. RUTH: Yeah it’s Kids Invent Stuff. Me and my friend Shawn started the channel about 18 months ago now. Each month we set a different invention challenge and we encourage 5 to 11 year olds to submit their ideas as pictures or videos, then we choose one to build. So we’ve made flaming pianos and custard firing superhero suits and crazy cars, they’re all inventions designed by kids. We want to encourage creativity and problem solving. It came from a lot of conversations, we realised we need to do more to encourage kids (particularly around the age of 8 but all kids) to look at STEAM and STEM. A really good way to do that is through inventing. They have their own ideas of what engineers or scientists are but inventing is seen as much more creative and fun, so it’s much easier to engage with kids around inventing. They’re so creative, they come up with the best ideas! So yeah we build one invention each month which is amazing and crazy and slightly mental. Ruth and Shawn presenting Kids Invent Stuff. You should watch it! DAN: So you set the challenges, do the kids ever come up with their own ideas for what they want to do next? RUTH: The kids do submit ideas sure but normally Shawn and I have think about themes or ideas we want to try. So most recently we did superheroes. Actually we work with Kisha who does a practical activity each month, there’s a worksheet on our website with an activity that kids can get to try at home or at school. Kisha designs those for us. So it’s a great way together and link the practical stuff with the aspirational stuff. DAN: You mentioned a flaming piano which makes me think of burnt fingers, do the flames come out of the top or something? RUTH: Yeah they come out of the back. As you play it actually shoots out fire or water depending on the keys that you press. That was the invention of a little boy called Radin and we took his piano to Cornwall where we got a very talented pianist to play it for us on the edge of the cliff. We caused havoc with flames and water everywhere. DAN: So we should talk a bit about Liverpool MakeFest. How did you come to get involved with the event? KISHA: Through Twitter really, I just saw it on Twitter and thought it could be a good thing for us to get involved with. Bright Box started by going to market stalls and giving people a peek at what we were doing, or maybe have a go themselves. So when I saw the Liverpool MakeFest I thought “I wonder what they would say if I offered to bring some drills to a market stall?” and I applied. DAN: Sweet, so what are you going to be doing there? I’ve got a feeling somebody told me you’re going to be outside the main entrance. KISHA: Yeah we’ll be outside, right by the entrance of the library and we’ll be one of the first things you see. We’re going to be making some drill art, so you’ll get the chance to learn how to use a drill and take something home with you. DAN: Wow, I really wanna know what drill art is now, I guess I should just come along and see. So you do courses and workshops, you’re doing loads of great stuff. If people want to get involved what’s the best way for them to find out more? KISHA: Go to our website and sign up for our mailing list, which I’m really bad at sending emails to so you don’t have to worry about being spammed. Also the Facebook page is a really good way to keep up to date. RUTH: So the website is girlswithdrills.com and the Twitter/Instagram handle is GirlsWithDrills. DAN: Great and for anyone listening don’t forget to get yourself a T-shirt or a hoodie and support the cause. There’s tote bags and all kinds of other great stuff. I could go on! RUTH: We actually have a couple of different designs as well. We launched with a very boxy, in your face logo design and then we had an illustration done by the very very talented Helen Drake who’s a great female artist in Sheffield. They’re all hand printed too. It’s always great and slightly bizarre when you go to events and see people wearing the tops. DAN: They’re really nice t-shirts too, so grab yourself one. You can look cool and support a good cause at the same time. Thank you both for joining us, we’ll see you in Liverpool on June 30th. KISHA: Perfect, see you soon. A big thanks for Ruth and Kisha for talking to me. Check out their website or just come and say hello on Saturday June 30th at Liverpool MakeFest. Grab yourself some free tickets! You can also sign up to volunteer and help out which we really appreciate. 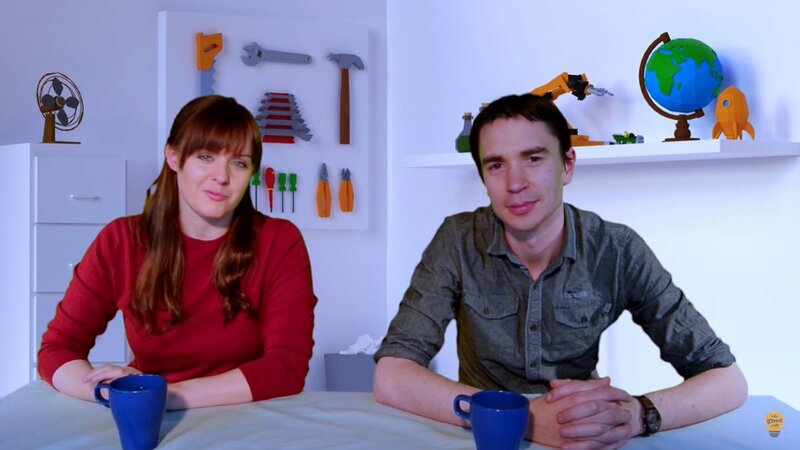 Next £500 giveaway for your maker project!